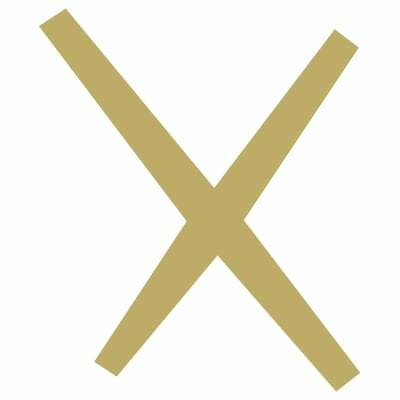 The Take Off, or Pop Up, can be done in multiple ways. 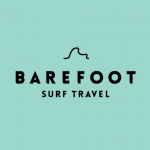 The technique below is the one we’ve had most success with over the last years at Barefoot Surf Travel. Take note, this technique only works for longboards and foamboards. If you are riding a shortboard, see “How to Stand Up on a Shortboard”. 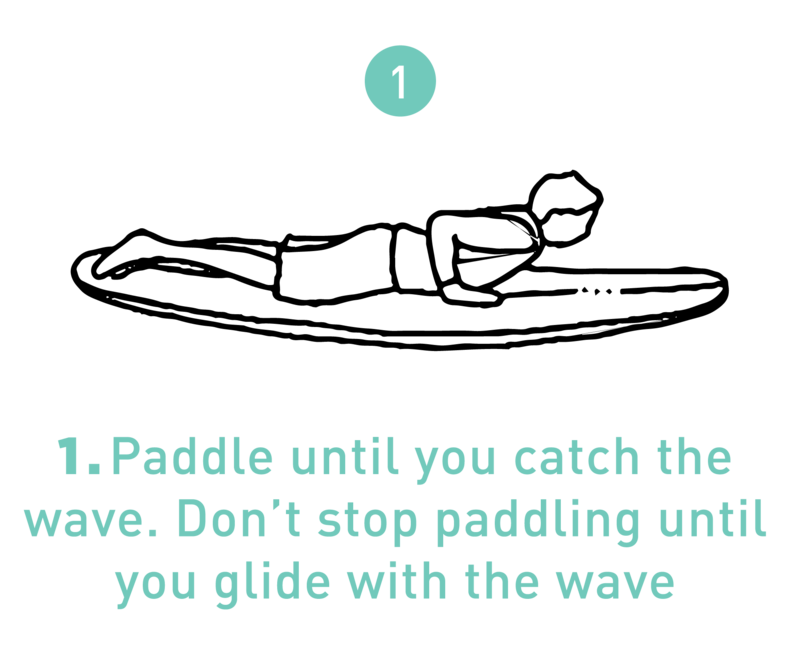 Paddle until you really have caught the wave. You must paddle until you glide with the wave. Not sure if you’ve caught the wave’s momentum completely? Give 2 extra paddles. After you catch the wave, place both your hands flat on the surfboard next to your pectorals. Do a “Push Up”. Your toes should be tucked on the surfboard’s tail. 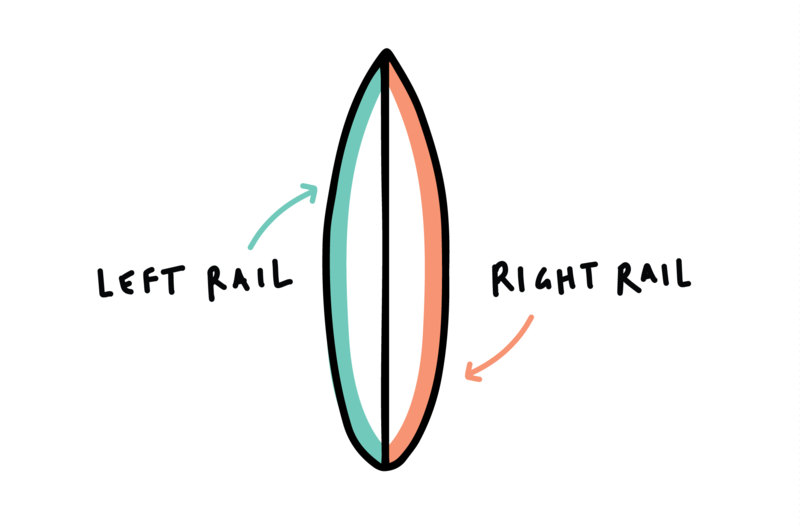 You should create space between your body and the surfboard: your knees, legs and waist should not touch the surfboard. First slide the back foot forward on the board. Your back foot should be brought at the position of your opposite knee, which is about 40-50 centimetres forward on your board. You can twist your body to help slide your back foot. 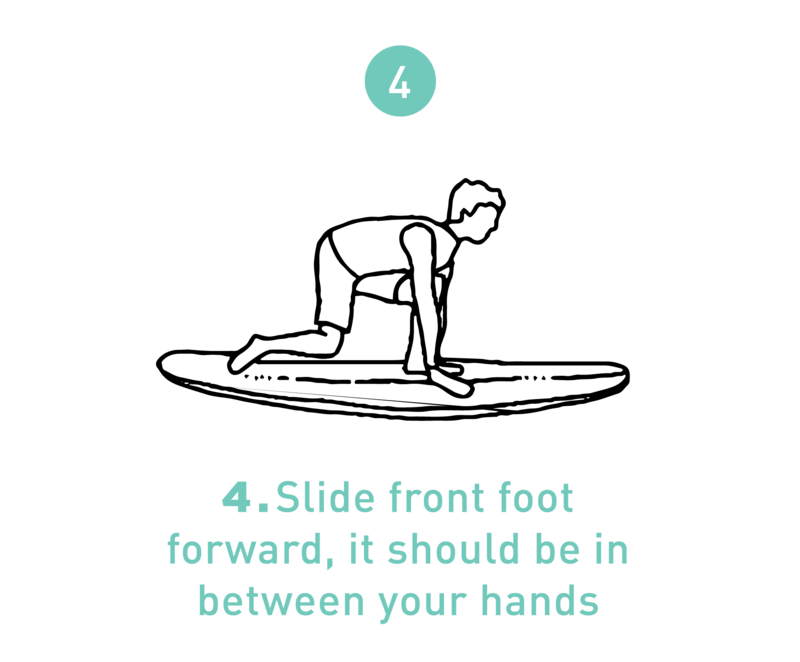 Then slide your front foot forward, it should go in between your two hands. Notice that the surfer always keeps his hands at the same position on the board when doing his pop up. His hands help stabilize the surfboard and maintain speed. Once you feel stable and comfortable, stand up. Make sure your feet are well positioned before you take your hands off the board. When standing up, keep your knees bent, compress your knees and lower body, and look where you are going. Make sure you have a good stance. 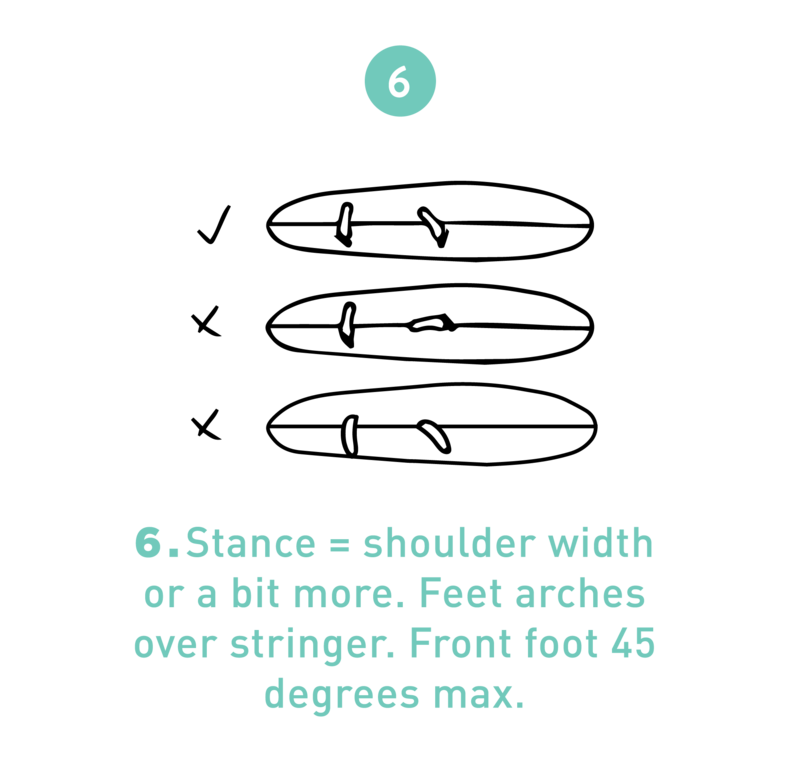 The distance between both your feet should be shoulder width or a bit more. 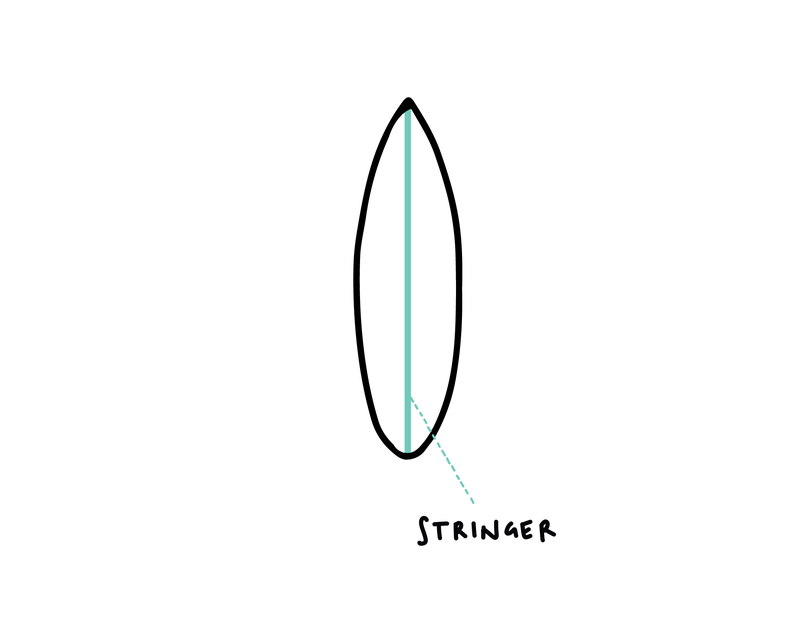 Your feet arches should be directly over the surfboard’s stringer. Your front foot should have an angle of 45 degrees maximum. See The Proper Surfing Stance for more details on the stance. Don’t grab the rails, put your hand flat under your pectorals. Grabbing the rails can make it harder to keep your balance, and creates drag underwater, slowing you down. Don’t push up with your hands in front of you. This is a typical “protection reflex”. As you catch a wave, you might put your hands in front of you on the surfboard, unconsciously trying to protect yourself. It’s impossible to do a pop up with your hands in front of the board. Keep them under your pectorals. Don’t bring your knees on the board. Another very common mistake is to bring your knees in front of your surfboard, instead of bringing your feet. In addition to adding steps and complications to your take off, it’s a bad habit in the long term for bigger, steeper waves that don’t give you much time to pop up. Don’t bring your front foot first, you will end up too far back on your longboard. Bringing the back foot first, then the front foot is the easiest way to keep your speed and to stay with the wave. Don’t unlock (straighten) your knees. Keep your knees bent and your lower body compressed down. Very often, we see beginner surfers “celebrate” their accomplishment. After standing up for the first time, they unbend their knees and throw their hands in the air. As soon as your legs are straight, it becomes very hard to keep your balance and you will most probably fall quickly. Don’t bend the upper body. This is probably the most common mistake we see beginners do. As they try to keep their balance when standing up, they bend the upper body down to bring it closer to the surfboard. In most cases, surfers end up falling off their surfboard in front of them. Once you bend the upper body, you can’t see where you are going and you can’t do a proper turn by using your chest, shoulder and head.